Mr. Lowry Pro is an automated trading system based on Scot Lowry moving average cross. This simple but effective method provides an optimal way to enter and exit the market by comparing the behavior of three moving averages, which combined with the advantages of an EA and the optimized parameters of SL and TP, results in a great automated trading tool. Trading Style: Select "Intraday" if you want your trades to close on the same day, "Swing" if you want your trades to close the same week and "Positioning" if you want to keep your trades open for more than a week. First Day of Trading: Select the day, on which you want to start trading. Last Day of Trading: Select the day, on which you want to end trading. Trading start time(0-24), just for intraday style: Indicate the time (0-24H), at which you want to start trading, only applies to intraday mode. Trading end time, intraday and Swing(last day of week): Indicate the time (0-24H) in which you want to finish operations, apply the last day of operation in Swing mode and every day in Intraday mode. Main period: Select the period you want to trade in (Moving averages are calculated with this value and not with the TF of the chart). Magic Number: Define a magic number, a different magic number is recommended for each chart. Max value for spread (Please Verify decimals for your Broker): Enter the maximum value you want, the EA will not open operations if the spread is greater. Use Autolot? : Define if you want to use Auto Lot or Fixed Lot. Autolot Volume(recommended 0.01-0.10 Lots/1k USD of Capital): For Auto Lot, enter the number of lots you want to open for each 1K dollars of capital. Fixed Lot (The EA always buys or sells this volume): For Fixed Lot, enter the number of lots you want to open each trade. Comment: Enter a comment for the operations. SL pips (Please Verify decimals for your Broker): Enter the Stop Loss level in pips. TP pips (Please Verify decimals for your Broker): Enter the level of Take Profits in pips. Support/resistance analysis level(0 to 10, Use 0 to deativate): This filter restricts operations by executing only those signals that match the breakout of support or resistance levels. Trailing SL Level(Pips, Use 0 to deactivate): Indicate the value of the Trailing Stop loss in Pips. 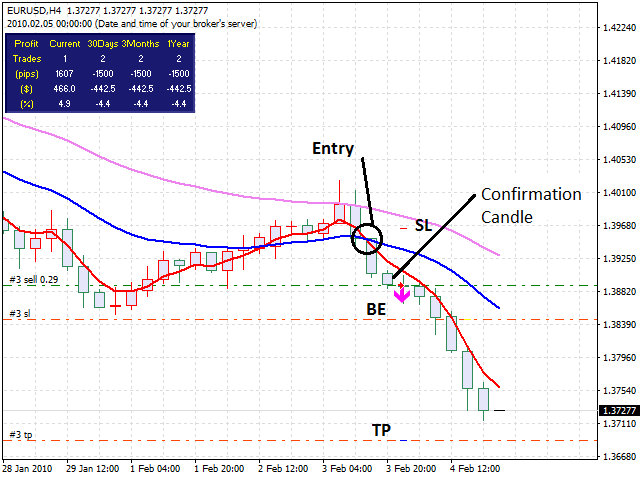 Trailing SL Entry(Pips): Enter the profit margin in pips from which you want to activate the TSL. Trailing SL Step(Pips): Indicate how often you want the Stop loss to be updated in Pips. 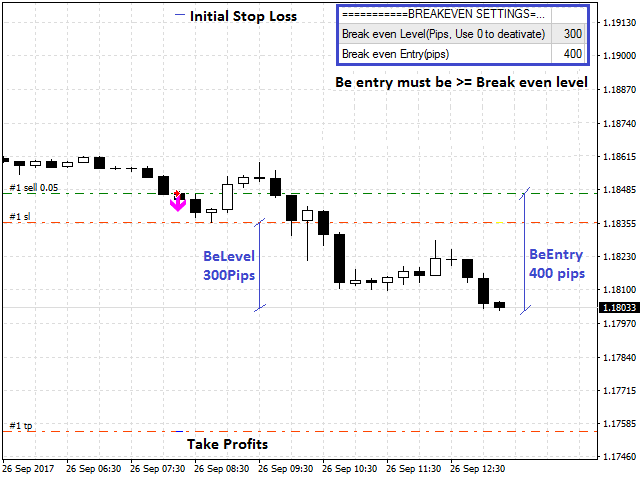 Break even Level(Pips, Use 0 to deactivate): Indicate the value of the Break Even in Pips. Break even Entry(Pips): Enter the minimum profit margin required to place the Break Even. Quick EMA1 (Recommended value 4): Indicate the fast Moving Average period. (Recommended value = 4). Medium EMA2 (Recommended value 18): Indicate the intermediate moving average period. (Recommended value = 18). Slow EMA3 (Recommended value 40): Indicate the Slow Moving Average period. (Recommended value = 40). Use EMA3 Like SL? : Select if you want to use the third EMA as SL. Entry Confirmation Candles? : Define a number of candles to confirm the trend. Lateral range filter(From 0 to 100, use 0 to deactivate): Enter a value, this value represents the minimum average movement in Pips required to open buy or sell trades. LateralFilterTF: Set the Timeframe to calculate the lateral range filter, a Timeframe >= Main Period is recommended. TH Level (0 to 20, Use 0 to deactivate): Select a value for the trend hunter filter. Minimum trend to Buy(>0, 0 to 100): Set a value> 0, this defines the minimum force required for the trend to open buy trades. Minimum trend to Sell(<0, 0 to 100): Set a value <0, this defines the minimum force required for the trend to open sell trades. VolatilityFilter (From 0 to 100): This is a volatility filter that avoids situations of low or high volatility, looking for normal market conditions to trade. Sendmail? : Select if you want to activate notifications by email. Important: The default input values for the Expert Advisor are optimized with historical data for the last 18 years for EUR / JPY in Main Period of 240 minutes. When you use this EA you should be aware that the results in the past are no guarantee of success in the future and that no one but yourself is responsible for any decisions or investment you make in the market. Tip: The EA uses only opening prices so it is not necessary to optimize each Tick, I recommend always optimizing with the open price model "Open price only" in 1M period, regardless of the "Main Period" defined in the input variables. Make sure you have complete information for all periods in the MetaTrader 4 history center. I don't have same backtests results as the author and contributors. Because I don't backtest with best quality and because I had it for free when it was and it seems well crafted, I wanted to give a try on demo. I use EURJPY M15, GBPUSD H1, USDJPY M30, USDCHF H1 sets from the Google drive since october 20th (ICMarkets Demo01). It's a bit early to take conclusions but for now this is mostly (very) bad ( -320 pips). -420 pips. I'm going to stop it for the moment. I may come back on it later with other sets. EA with good potential. I keep trying. Really stable EA with some features and implementations that make it reliable and safe. MAx spread: 10 ( well i think this is too much isnit ? the rest i didnt made any changes since i have no clue o idea how to config it in a way it make sense for my M1 graphic but this values looks to high for me any clue ? solution more professional than the normal version. But parameters. TSL, Break Even, you can customize the Mobile Averages for any currency. One of the most used and safe techniques in the world of trading now in an EA. Some internal changes were made to improve efficiency. Some errors with the summary table have been fixed. A volatility filter has been included, important to avoid operating in unusual market conditions, it must be optimized between values from 0 to 100. 1. The lateral range filter has been simplified, just optimize this value from 1 to 100 in any TF. It is recommended a TF> = that the period of application of the EA. 2. Trend filter (Trend Hunter) has been simplified in a similar way to the lateral range filter. 3. A filter for supports/resistances analysis has been included. An error in the closing of trades in the Swing trading style has been fixed. 1. Lowry exit options and exit confirmation candles are eliminated, and the option to use EMA3 as SL is included instead. 2. The option to select the Time Frame for the side filter is included. 1. A filter to avoid lateral markets has been included. 2. A filter to detect tendencies movements has been included. 3. The option of notification by email has been included. 1 Fixed bug of the improper close of trades when restarting MetaTrader 4. 2 Internal changes have been made to improve the EA´s efficiency. 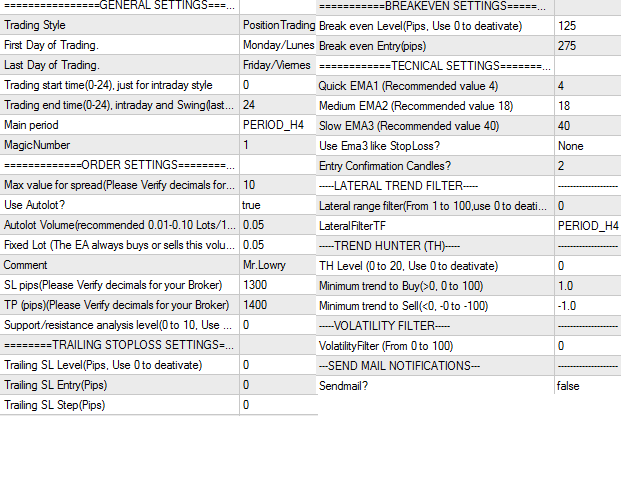 A daily spread summary table has been included, very useful when your broker has dynamic spread and you want to minimize the spread. 1. The maximum number of open operations at the same time has been limited to 1. 2. Internal changes have been made to improve the EA´s efficiency. The program code has been simplified in order to improve program performance in the optimization stages, significantly reducing the processing times of the tests in the strategy tester. 1. Fixed some errors in "Trailing Stop Loss" and BreakEven with Stoploss = 0. 2. Fixed some errors with the Order Close when End Time = 24H.